This article is about the language. For the Chinese people sometimes called Yue, see Cantonese people. "Yueyu" redirects here. It is not to be confused with Yuyue (disambiguation), Yuyu (disambiguation), or Yueyue (disambiguation). Hong Kong and Macau (de facto, though officially referred to as "Chinese"; Cantonese and occasionally Mandarin are used in government). Recognised regional language in Suriname. Yue or Yueh (English pronunciation: /ˈjuːeɪ/ or /juːˈeɪ/) is a primary branch of Chinese spoken in South China, particularly the provinces of Guangdong and Guangxi. The name Cantonese is often used for the whole branch, but linguists prefer to reserve that name for the variety of Guangzhou (Canton) and Hong Kong, which is the prestige dialect. Taishanese, from the coastal area southwest of Guangzhou, was the language of most of the 19th-century emigrants from Guangdong to Southeast Asia and North America. Most later migrants have been speakers of Cantonese. Yue dialects are not mutually intelligible with other varieties of Chinese. They are among the most conservative varieties with regard to the final consonants and tonal categories of Middle Chinese, but have lost several distinctions in the initial and medial consonants that other Chinese varieties have retained. The prototypical use of the name Cantonese in English is for the Guangzhou (Canton) dialect of Yue, but it is commonly used for Yue as a whole. To avoid confusion, academic texts may call the primary branch of Chinese "Yue", following the Mandarin pinyin spelling, and either restrict "Cantonese" to its common usage as the dialect of Guangzhou, or avoid the term "Cantonese" altogether and distinguish Yue from Canton or Guangzhou dialect. In Chinese, people of Hong Kong and Macau, and Cantonese immigrants abroad, usually call their language Gwóngdùng wá [kʷɔ̌ːŋ tʊ́ŋ wǎː] (廣東話) "speech of Guangdong". [lower-alpha 1] People of Guangdong and Guangxi do not use that term, but rather Yuht Yúh [jỳt jy̬ː] (粵語) "Yue language". They also use baahk wá [pàːk wǎː] (白話) on its own to refer to the Guangzhou dialect. It is also used in Guangxi to refer to Yue dialects, as for example in an expression like "南宁白话", which means the "baak waa of Nanning". The area of China south of the Nanling Mountains, known as the Lingnan (roughly modern Guangxi and Guangdong), was originally home to peoples known to the Chinese as the Hundred Yue. Large-scale Chinese migration to the area began after the Qin conquest of the region in 214 BC. Successive waves followed at times of upheaval in North China, such as the falls of the Han, Tang and Song dynasties. The most popular route was via the Xiang River, which the Qin had connected to the Li River by the Lingqu Canal, and thence into the valley of the Xi Jiang (West River). A secondary route followed the Gan River and then the Bei Jiang (North River) into eastern Guangdong. Yue-speakers were later joined by Hakka-speakers following the North River route, and Min-speakers arriving by sea. After the fall of Qin, the Lingnan area was part of the independent state of Nanyue for about a century, before being incorporated in the Han empire. After the Tang dynasty collapsed, much of the Yue area became part of the Southern Han, one of the longest-lived states of the Five Dynasties and Ten Kingdoms, between 917 and 971. The waves of Chinese migration assimilated huge numbers of aborigines, with the result that today's Yue-speaking population is descended from both groups. The colloquial layers of Yue dialects contain elements influenced by the Tai languages formerly spoken widely in the area and still spoken by people such as the Zhuang. The port city of Guangzhou lies in the Pearl River Delta, with access to the interior via the West River, North River and East River, which converge at the delta. It has been the economic centre of the Lingnan region since Qin times, when it was an important shipbuilding centre. By 660, it was the largest port in China, part of a trade network stretching as far as Arabia. During the Southern Song, it also became the cultural centre of the region. Like many other Chinese varieties it developed a distinct literary layer associated with the local tradition of reading the classics. The Guangzhou dialect (Cantonese) was used in the popular Yuèōu, Mùyú and Nányīn folksong genres, as well as Cantonese opera. There was also a small amount of vernacular literature, written with Chinese characters extended with a number of non-traditional characters for Cantonese words. Guangzhou became the centre of rapidly expanding foreign trade after the maritime ban was lifted, with the British East India Company establishing a chamber of commerce in the city in 1715. The ancestors of most of the Chinese population of Hong Kong came from Guangzhou after the territory was ceded to Britain in 1842. As a result, Hong Kong Cantonese, the most widely spoken language in Hong Kong and Macau, is an offshoot of the Guangzhou dialect. The popularity of Cantonese-language media, Cantopop and the Cinema of Hong Kong has since led to substantial exposure of Cantonese to China and the rest of Asia. On the Mainland, the national policy is to promote Standard Chinese, which is also the medium of instruction in schools. The place of local Cantonese language and culture remains contentious. In 2010, a proposal to switch some programming on Guangzhou television from Cantonese to Mandarin was abandoned following public protests. 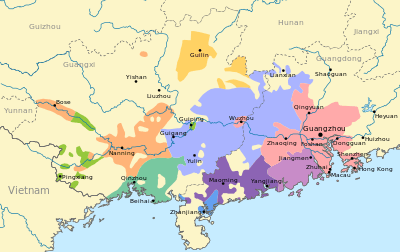 Yue dialects are spoken in the southern provinces of Guangdong and Guangxi, an area long dominated culturally and economically by the city of Guangzhou (Canton) at the mouth of the Pearl River. The Cantonese dialect, also spoken in Hong Kong and Macau, is the prestige variety of Yue. The influence of Guangzhou has spread westward along the Pearl River system, so that for example the speech of the Guangxi city of Wuzhou some 190 km upstream is much more similar to that of Guangzhou than dialects of coastal districts that are closer but separated from the city by hilly terrain. One of these coastal dialects, Taishanese, is the most common Yue dialect among overseas communities. Yue dialects are not all mutually intelligible. Yuehai, covering the Pearl River Delta and Xi River valley. Siyi (Seiyap "four counties"), in the coastal prefecture of Jiangmen to the southwest of Guangzhou. Qin–Lian (Hamlim) in southern Guangxi. 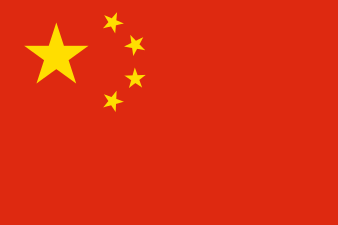 Guangfu (廣府話) includes Cantonese proper, spoken in Guangzhou, Hong Kong and Macau, as well as the dialects of surrounding areas in the Pearl River Delta such as Zhongshan, Foshan, Dongguan and Shenzhen, and in southern parts of the inland prefectures of Zhaoqing and Qingyuan and in parts of Guangxi such as the city of Wuzhou. Gou–Lou (Ngaulau) dialects are spoken in inland areas of western Guangdong and eastern Guangxi, and include the dialect of Yulin (Bobai). Yong–Xun (Jungcam) is spoken mainly in the Yong–Yu–Xun valley in Guangxi, including the provincial capital Nanning. 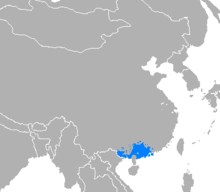 Siyi dialects are spoken in the coastal prefecture of Jiangmen to the southwest of Guangzhou. They include the Taishan dialect, also known as Taishanese, which was ubiquitous in American Chinatowns before the 1970s. Gao–Yang dialects are spoken in areas of southwestern Guangdong such as Yangjiang and Lianjiang. Wu–Hua is spoken mainly in western Guangdong around Wuchuan and Huazhou. Qin–Lian dialects are spoken in the southern Guangxi areas of Beihai, Qinzhou and Fangcheng. Interior: western part of the Pearl River catchment, including the Atlas's Gou–Lou and southern Pinghua dialects. Interior: Gao–Yang dialects of Maoming and the Yong–Xun dialects of Nanning and Guiping. Guan–Lian: dialects of the east delta region (Dongguan and the New Territories) as well as the coastal Guangxi dialects classified as Qin–Lian in the Atlas. Xin–En: Xinhui, Taishan, Enping and the neighbouring Doumen District. The Guangzhou (Canton) dialect of Yuehai, usually called "Cantonese", is the prestige dialect of Guangdong province and social standard of Yue. It is the most widely spoken dialect of Yue and is an official language of Hong Kong and of Macau, alongside English and Portuguese respectively. It is the lingua franca of not only Guangdong province but also of overseas Cantonese emigrants, though in many areas abroad it is numerically second to the Taishanese dialect of Yue. By law, Mandarin Chinese (Putonghua or guoyu) is the standard language of mainland China and Taiwan and is taught nearly universally as a supplement to local languages such as Cantonese in Guangdong. In Guangzhou, many distinctively Yue vocabulary items have been replaced with Cantonese pronunciations of corresponding Putonghua terms. Cantonese is the de facto official language of Hong Kong (along with English) and Macau (along with Portuguese), though legally the official language is just "Chinese". It is the oral language of instruction in Chinese schools in Hong Kong and Macau, and is used extensively in Cantonese-speaking households. Cantonese-language media (Hong Kong films, television serials, and Cantopop), isolation from the other regions of China, local identity, and the non-Mandarin speaking Cantonese diaspora in Hong Kong and abroad give the language a unique identity. Colloquial Hong Kong Cantonese often incorporates English words due to historical British influences. Most wuxia films from Canton are filmed originally in Cantonese and then dubbed or subtitled in Mandarin, English, or both. When the Chinese government removed the prohibition on emigration in the mid-19th century, many people from rural areas in the coastal regions of Fujian and Guangdong emigrated to Southeast Asia and North America. Until the late 20th century, the vast majority of Chinese immigrants to North America came from the Siyi (four counties) to the southwest of Guangzhou. The speech of this region, particularly the Taishan dialect, is thus the most common Yue variety in these areas. It is only partially understood by speakers of Cantonese. Yue dialects are among the most conservative of Chinese varieties regarding the final consonants and tonal categories of Middle Chinese, so that the rhymes of Tang poetry are clearer in Yue dialects than elsewhere. However they have lost several distinctions in the initial and medial consonants that other Chinese varieties have retained. In addition to aspirated and unaspirated voiceless initials, Middle Chinese had a series of voiced initials, but voicing has been lost in Yue and most other modern Chinese varieties apart from Wu and Old Xiang. In the Guangfu, Siyi and Gao–Yang subgroups, these initials have yielded aspirated consonants in the level and rising tones, and unaspirated consonants in the departing and entering tones. These initials are uniformly unaspirated in Gou–Lou varieties and uniformly aspirated in Wu–Hua. In many Yue dialects, including Cantonese, Middle Chinese /kʰ/ has become [h] or [f] in most words; in Taishanese, /tʰ/ has also changed to [h], for example, in the native name of the dialect, "Hoisan". In Siyi and eastern Gao–Yang, Middle Chinese /s/ has become a voiceless lateral fricative [ɬ]. Most Yue dialects have merged the Middle Chinese retroflex sibilants with the alveolar sibilants, in contrast with Mandarin dialects, which have generally maintained the distinction. For example, the words 將 jiāng and 張 zhāng are distinguished in Mandarin, but in modern Cantonese they have the same sound, jeung1. Many Mandarin dialects, including that of Beijing, have a third sibilant series, formed through a merger of palatalized alveolar sibilants and velars, but this is a recent innovation, which has not affected Yue and other Chinese varieties. For example, 晶, 精, 經 and 京 are all pronounced as jīng in Mandarin, but in Cantonese the first pair is pronounced jīng, and the second pair gīng. The earlier pronunciation is reflected in historical Mandarin romanizations, such as "Peking" (Beijing), "Kiangsi" (Jiangxi) and "Tientsin" (Tianjin). Some Yue speakers, such as many Hong Kong Cantonese speakers born after World War II, merge /n/ with /l/, but Taishanese and most other Yue dialects preserve the distinction. Younger Cantonese speakers also tend not to distinguish between /ŋ/ and the zero initial, though this distinction is retained in most Yue dialects. Yue dialects retain the initial /m/ in words where Late Middle Chinese shows a shift to a labiodental consonant, realized in most Northern varieties of Chinese as [w]. Nasals can be independent syllables in Yue words, e.g. Cantonese ńgh (五) "five", and m̀h (唔) "not", although Middle Chinese did not have syllables of this type. In most Yue dialects (except for Tengxian), the rounded medial /w/ has merged with the following vowel to form a monophthong, except after velar initials. In most analyses velars followed by /w/ are treated as labio-velars. Most Yue dialects have retained the Middle Chinese palatal medial, but in Cantonese it has also been lost to monophthongization, yielding a variety of vowels. Middle Chinese syllables could end with glides /j/ or /w/, nasals /m/, /n/ or /ŋ/, or stops /p/, /t/ or /k/. Syllables with vocalic or nasal endings could occur with one of three tonal contours, called level (píng 平), rising (shǎng 上) or departing (qù 去). Syllables with final stops were traditionally treated as a fourth tone category, the entering tone (rù 入), because the stops were distributed in the same way as the corresponding final nasals. While northern and central varieties have lost some of the Middle Chinese final consonants, they are retained by most southern Chinese varieties, though sometimes affected by sound shifts. They are most faithfully preserved in Yue dialects. Final stops have disappeared entirely in most Mandarin dialects, including the Beijing-based standard, with the syllables distributed across the other tones. For example, the characters 裔, 屹, 藝, 憶, 譯, 懿, 肄, 翳, 邑, and 佚 are all pronounced yì in Mandarin, but they are all different in Yue (Cantonese jeoi6, ngat6, ngai6, jik1, jik6, ji3, ji6, ai3, jap1, and jat6, respectively). Similarly, in Mandarin dialects the Middle Chinese final /m/ has merged with /n/, but the distinction is maintained in southern varieties of Chinese such as Hakka, Min and Yue. For example, Cantonese has taahm (譚) and tàahn (壇) versus Mandarin tán, yìhm (鹽) and yìhn (言) versus Mandarin yán, tìm (添) and tìn (天) versus Mandarin tiān, and hàhm (含) and hòhn (寒) versus Mandarin hán. Middle Chinese is described in contemporary dictionaries as having four tones, where the fourth category, the entering tone, consists of syllables with final stops. Many modern Chinese varieties contain traces of a split of each of these four tones into two registers, an upper or yīn register from voiceless initials and a lower or yáng register from voiced initials. Mandarin dialects retain the register distinction only in the level tone, yielding the first and second tones of the standard language (corresponding to the first and fourth tones in Cantonese), but have merged several of the other categories. Most Yue dialects have retained all eight categories, with a further split of the upper entering tone conditioned by vowel length, as also found in neighbouring Tai dialects. A few dialects spoken in Guangxi, such as the Bobai dialect, have also split the lower entering tone. While most Chinese varieties form compounds consisting of a qualifier followed by a qualified element, Yue dialects use the reverse order. For example, the Standard Chinese word for "guest" is 客人 kèrén "guest-person", but the same morphemes are interchanged in Cantonese jɐn ha:k, Taishanese ŋin hak and Tengxian jən hɪk. This is generally attributed to the influence of Tai languages, in which modifiers normally follow nouns. Gender markers for nouns are also suffixed, as in other southern varieties. Some Yue dialects, including Cantonese, use the same word bīn-go (邊個), meaning "which one", for both "who" and "which". Other dialects, including Taishanese, use sŭe (誰, cognate with the word used in Mandarin) for "who", and words meaning "which one" for "which". ↑ Hammarström, Harald; Forkel, Robert; Haspelmath, Martin; Bank, Sebastian, eds. (2016). "Yue Chinese". Glottolog 2.7. Jena: Max Planck Institute for the Science of Human History. ↑ "Yueh", Webster's Third International Dictionary. 1 2 3 Ramsey (1987), p. 98. ↑ Kurpaska (2010), pp. 76, 176. 1 2 Yue-Hashimoto (1972), p. 1. ↑ Yue-Hashimoto (1972), pp. 2–3. 1 2 3 Yue-Hashimoto (1972), p. 2. ↑ Yue-Hashimoto (1972), p. 3. 1 2 Yue-Hashimoto (1972), p. 4. ↑ Yue-Hashimoto (1972), p. 6. ↑ Li (2006), pp. 19–20. 1 2 Li (2006), p. 126. ↑ Yue-Hashimoto (1972), p. 5. ↑ Yue-Hashimoto (1972), pp. 5–6. 1 2 Ramsey (1987), p. 99. ↑ Yue-Hashimoto (1972), p. 70. ↑ Zhang & Yang (2004), p. 154. ↑ Bolton (2011), pp. 66–68. ↑ Ramsey (1987), p. 23. ↑ Killingley (1993), p. 2. 1 2 Wurm et al. (1987). ↑ Yan (2006), pp. 192–193. ↑ Kurpaska (2010), p. 76. ↑ Bauer & Benedict (1997), pp. xxxvii–xxxviii. ↑ Yan (2006), pp. 195–196. ↑ Yue (2006), pp. 76–77. ↑ Yue (2015), p. 186. ↑ Norman (1988), p. 215. 1 2 Yue-Hashimoto (1972), p. 10. ↑ Bauer & Benedict (1997), pp. 431–432. ↑ Szeto (2001), p. 4. ↑ Skeldon (2003), p. 57. ↑ Ramsey (1987), pp. 99–100. 1 2 3 4 Norman (1988), p. 216. ↑ Yan (2006), p. 193. ↑ Ramsey (1987), pp. 100–101. ↑ Yan (2006), p. 204. 1 2 3 Norman (1988), p. 193. ↑ Bauer & Benedict (1997), pp. 24, 32–33. ↑ Bauer & Benedict (1997), pp. 24–25. 1 2 Ramsey (1987), p. 101. ↑ Norman (1988), pp. 216–217. 1 2 Norman (1988), p. 217. ↑ Norman (1988), p. 52. ↑ Norman (2003), p. 77. ↑ Norman (2003), p. 80. 1 2 Yue-Hashimoto (1972), p. 20. ↑ Yue-Hashimoto (1972), p. 48. Bauer, Robert S.; Benedict, Paul K. (1997), Modern Cantonese Phonology, Walter de Gruyter, ISBN 978-3-11-014893-0. Bolton, Kingsley (2011), "Language policy and planning in Hong Kong: Colonial and post-colonial perspectives", Applied Linguistics Review, 2: 51–74, doi:10.1515/9783110239331.51, ISBN 978-3-11-023933-1. Killingley, Siew-Yue (1993), Cantonese, Lincom Europa, ISBN 978-3-929075-12-0. Li, Qingxin (2006), Maritime Silk Road, trans. William W. Wang, China Intercontinental Press, ISBN 978-7-5085-0932-7. Norman, Jerry (1988), Chinese, Cambridge University Press, ISBN 978-0-521-29653-3. —— (2003), "The Chinese dialects: phonology", in Thurgood, Graham; LaPolla, Randy J., Sino-Tibetan Languages, London: Routledge, pp. 72–83, ISBN 978-0-7007-1129-1. Ramsey, S. Robert (1987), The Languages of China, Princeton, New Jersey: Princeton University Press, ISBN 978-0-691-01468-5. Skeldon, Ronald (2003), "The Chinese diaspora or the migration of Chinese peoples? ", in Ma, Laurence J. C.; Cartier, Carolyn L., The Chinese Diaspora: Space, Place, Mobility, and Identity, Rowman & Littlefield, pp. 51–68, ISBN 978-0-7425-1756-1. Szeto, Cecilia (2001), "Testing intelligibility among Sinitic dialects" (PDF), in Allan, Keith; Henderson, John, Proceedings of ALS2k, the 2000 Conference of the Australian Linguistic Society. Yue-Hashimoto, Anne Oi-Kan (1972), Studies in Yue Dialects 1: Phonology of Cantonese, Cambridge University Press, ISBN 978-0-521-08442-0. Yue, Oi-Kan (2006), "Yuè yīn gòunǐ zhī èr: shēngmǔ" 粵音構擬之二：聲母 [Reconstruction of the Yue dialects II: initials], in Ho, D.-a. ; Cheung, S.; Pan, W.; Wu, F., Shāngāo shuǐ cháng: Dīng Bāngxīn xiānshēng qī zhì shòu qìng lùnwén jí 山高水長:丁邦新先生七秩壽慶論文集 [Linguistic Studies in Chinese and Neighboring Languages: Festschrift in Honor of Professor Pang-Hsin Ting on His 70th Birthday], Taipei: Institute of Linguistics, Academia Sinica, pp. 75–170. Yue, Anne O. (2015), "The Yue language", in Wang, William S.-Y. ; Sun, Chaofen, The Oxford Handbook of Chinese Linguistics, Oxford University Press, pp. 173–188, ISBN 978-0-19-985633-6. Kwok, Bit-Chee; Chin, Andy C.; Tsou, Benjamin K. (2016), "Grammatical diversity across the Yue dialects", Journal of Chinese Linguistics, 44 (1): 109–152, doi:10.1353/jcl.2016.0002. Yue-Hashimoto, Anne (1991), "The Yue dialect", in Wang, William S.-Y., Languages and Dialects of China, Journal of Chinese Linguistics Monograph Series, 3, Chinese University Press, pp. 292–322, JSTOR 23827041, OCLC 600555701. Chan, Marjorie K.M. (1980), Zhong-shan phonology: a synchronic and diachronic analysis of a Yue (Cantonese) dialect (MA thesis), University of British Columbia. Huang, Karen (2009), "A reconstruction of proto-Yue vowels" (PDF), Working Papers in Linguistics, Department of Linguistics, University of Hawaii, 40 (2).